Proper shoes provide golfers with stability in the swing. Manufacturers design athletic footwear to fit the needs of the person participating in different sports. People often increase their chance of injury when they wear shoes not designed for the sport. 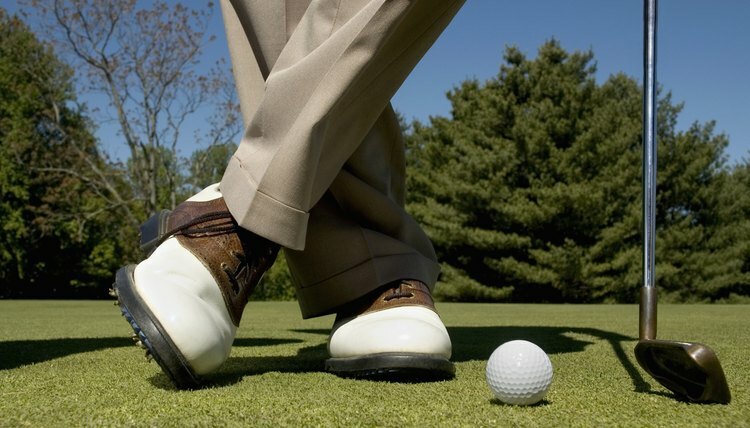 Many beginning golfers wear whatever shoes they have on hand before hitting the golf course. Many of the benefits of golf shoes include helping golfers be comfortable as they play. Modern technology allows golfers to get good golf shoes. One of the benefits of golf shoes is their wide-track rubber soles increase their sturdiness and sharp tongs to prevent slipping on the grass. The material used to design golf shoes makes them firm yet lightweight. Golf shoes provide stable, solid arch support, something not provided by footwear used for other activities. There is extra padding in the shoes that support the midfoot and shock absorption needed. This midfoot support is particularly important when driving the ball because golfers end their stroke on the balls of their feet. The leather used to make golf shoes is flexible and comfortable for walking on a long golf course. Many golf shoes are made of material that increases breathability. Golf shoes made with Gore-Tex lining absorb moisture, preventing sweating feet and allowing feet to breathe. Some shoes contain a foot bed combining polyurethane and charcoal, other agents that soak up foot moisture. A function of polyurethane includes warming and cooling feet. One of the benefits of spiked golf shoes is they improve the grip of the shoes as golfers walk. New technology used to make spikes keeps golfers active and helps them make quick turns when they strike the ball. Detachable twist spikes on the out-sole of the shoes helps golfers maintain traction on a variety of golf course surfaces. Spikeless golf shoes benefit the ground more than the golfer. Spikeless golf shoes do not damage the golf course as much as spiked shoes. But they are just as sturdy, comfortable and supportive of traditional spiked shoes. They are designed to evenly distribute body weight and improve flexibility. Spikeless shoes cost less than most spiked golf shoes. And most golf courses require players to wear spikeless shoes.